Michelle Kiso did more than organize a three-day event for prospective students last February. The graduate coordinator for the Department of Computer Science even got up at 4 a.m. on a Sunday morning to take two of the students to the airport because the Hilton Gardens Hotel Shuttle wasn’t available. Talk about above and beyond the call of duty! “Her actions showed how important these candidates are to Computer Science and the Hajim School,” wrote Eileen Pullara, the department’s administrator. Kiso’s good deed earned her a Hajim School bravo chip, thanks to Pullara’s nomination. Launched in 2011 by former dean Rob Clark, the bravo chip program “recognizes exemplary work” done by Hajim School and other University staff members in support of the school. It relies on nominations from fellow staff members, faculty members, department chairs, and administrators. 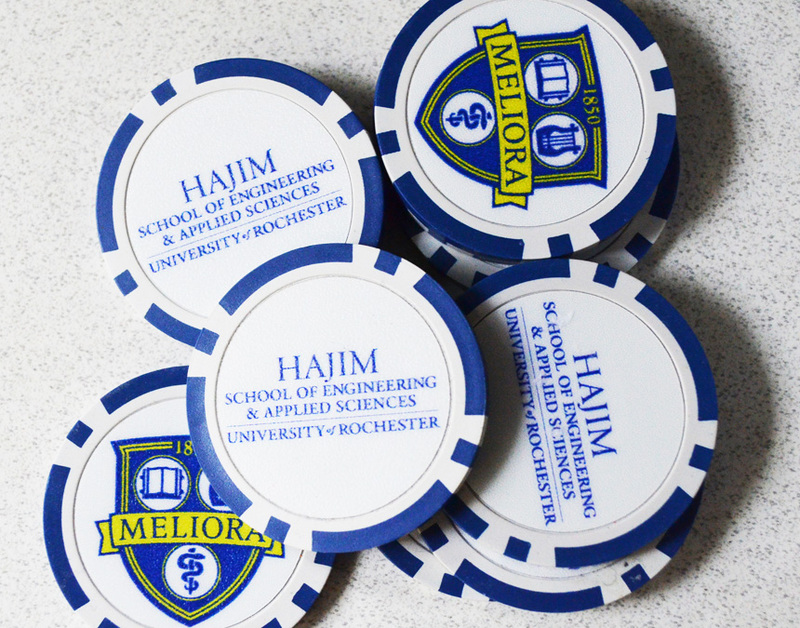 Recipients receive a letter of commendation and a distinctive blue and white Hajim School poker chip redeemable for a gift valued at $25 from the University IT Computer Store or a meal on campus at the Meliora, Douglass, and Danforth dining centers. Some recipients hold on to them as valued mementoes. As of December 2016, 400 bravo chips had been awarded to 211 individuals, of whom 71 (including Kiso and Pullara) have received multiple awards. While the reward is small in dollar value, says Jason Sabel, assistant chair of electrical and computer engineering, he believes it has a long-term benefit by improving employee morale. The program is also a good barometer of the cooperation that occurs across multiple departments, both within the Hajim School and across the University. Last year, for example, the Hajim School undergraduate coordinators, as a group, nominated colleagues in the Registrar’s Office for promptly handling requests to change rooms, raise enrollment caps on courses, and add new sections to help accommodate the school’s increased enrollments. When the graduate coordinator that Kiso replaced in computer science was not able to stay on and train her, Kiso turned to Michele Foster, her counterpart in electrical and computer engineering, as her “go to” person. “The help she (Foster) has provided to me, even though it was not her responsibility to, is a demonstration of her dedication to supporting student success for all students in the Hajim School,” Kiso wrote in nominating Foster for one of the many bravo chips she has earned. Similarly, Donna Porcelli, graduate program coordinator in biomedical engineering and another multiple bravo chip recipient, became the “go to” person when a graduate coordinator went on disability in another department. Porcelli answered “many, many questions . . . happily and with a great deal of patience,” her bravo citation notes. Click here for recipients grouped by the year awarded.